Yes, this weekend we, as followers of Jesus Christ and His Teachings remember when God, the Father of Creation, (Yahweh, Jehovah, Devum) provided His Own Son, as the Sacrificial Lamb, as the offering for salvation of Humanity, as well as for all those who understood this, to provide them with the Blood Covering of Protection, from the Eternal Death, to which Satan and his demons are not only condemned to endure, but all those that decide to rebel alongside them, against the Divine Laws of Love of the Eternal Kingdom. Jesus Christ (Yeshu Christu, Yeshua, Yeshuay) showed us through His Life, a life that follows the Divine Laws of Love of the Eternal Kingdom, ways of Nonviolence, Unconditional Love, and Mercy. As we saw with His Life, those that follow the Divine Laws of Love, will live a life that goes against the grain of society’s norms, which are peaceful, which is loving, but at the same time, does not tolerate any injustice done. They are often considered the lowest to society’s classes, because God did say that His Ways do not conform to the world’s ways, but are beyond them. So, whatever may seem beautiful in the worldly sense, ,may not be to the standards of the Eternal Kingdom. As God demonstrated through the Life and Death of Jesus Christ, as a member of the Most High Court of the Eternal Kingdom, Jesus Christ lived a life that was not considered of high standards, in the earthly sense….as that of nobility or even royalty. This is the extent that God went to show Humanity that earthly standards do not conform to the ways of the Eternal Kingdom. That those that belong to the Eternal Kingdom will need to demonstrate that the ways of this world do not outweigh the ways of the Eternal Kingdom, in one’s mind, heart, body, and soul. A soul that has understood what was done at the Cross will understand that the Son of God, Jesus Christ (Yeshu Christu, Yeshuay, Yeshua) died, in order to give Humanity one final chance to see God’s Unconditional Love….to the extent of making His Own Son, as the Sacrificial offering for the repentance of Humanity’s Sinful Human Nature, which resulted in so many selfish things, violence, and conditional love, that was chosen out their free will. What we must remember is that God does not force His Ways onto Humanity…He has given us the choice, everyday we live and breathe on this earth. Easter or Resurrection Day, is the cornerstone of the Christian faith, not Christmas, because this the day to which God completed the execution of His Plan to conquer Satan and his deMons, againsg their attacks on His most prized creations, Humanity. God loved Humanity so much, that He offered His Son, as His Most Prized Lamb to be sacrificed, for the repentance of His most prized creation, Humanity. As God instructed Moses for the Jews to put lamb’s blood on their doorways, in order to protect them from the Angel of Death, to pass over their homes, and to kill the first born in Egypt….Jesus Christ (Yeshu Christu, Yeshuay, Yeshua)…..was God’s (Jehovah, Yahweh, Devum) Sacrificial Lamb, and that becomes the blood covering for those who see and understand the Cruxificion that led to the Death….and the Resurrection of Jesus Christ (Yeshu Christu, Yeshuay, Yeshua). This entry was posted in Thoughts and tagged Armor of God, Battling Evil, Christianity, compassion, Devum, discernment, Earth, enduring trials, Evil, evil ways are temporary, Faith, Fight over souls (good vs. evil), God's Love, God's Promise, God's ways are permanent, God's Wrath, Good vs. Evil, Guidance, Holy Spirit, Jehovah, Jesus, Jesus and His Crucifixion, Jesus Christ, Justice for "the Just", Listen for God's Call, Path to Truth, Persecution, Satan, Satan's deception, SELF LOVE vs. SELFLESS LOVE, Spiritual Battles, Steadfast Faith, Unconditional Love, Yahweh, Yeshu, Yeshu Christu, Yeshua, Yeshuay on March 26, 2016 by foodforthespiritualsoul. In all this, God has shown me His Great Power, which is both reassuring, and bone chilling at the same time, for me. All with great reverence for God, the Father of Creation. He showed me in all this that God never forgets the tears shed by a loyal, humble heart, and the need for forgiveness, because this is what He commands of us. It was 18 years of tears, of having holidays without family, and them continuously trying to justify why they all took active part in the support of this event, so that they can hide the truth from now the new inlaws coming into the family (otherwise it will show their true nature), and the younger cousins that were too young to know what happened. God also taught me, that no matter what earthly title someone holds in your life, mother, father, uncle, aunt, cousin, friend, stranger… that evil will use ANYONE for its purpose. This is why God states that He should be first and foremost in one’s life. So that we can have the guidance of the Holy Spirit to help us discern the deception of evil. This is when God made me understand that His Ways are not of the world’s ways, but are beyond them. That our reliance in life, should be solely on Him, and He will always provide. He means business when it comes to this. At the same time, for putting God first and foremost in our lives, we will be tested and tried even harder by Satan and his demons. Because if we hold on to that unforgiveness, this only allows for Satan and his demons to grab onto souls faster. I can honestly say that I have forgiven my Uncle, though never officially hearing the words “I’m sorry” from him. As to what I think my uncle came away with in all this, well, that is up to God now, as to determining his repentance, and whether it was true in His Eyes, for what he did to me and family, on that day. Upon his last breath on this earth, his story was written in its final form, in God’s Book. Those of us still on this earth, still have another chance to make things right in God’s Eyes, as to the harm we cause one another….and the forgiveness that we share. Love and forgiveness is what God DEMANDS and COMMANDS for us to do, and this is what Jesus Christ showed us on the Cross. 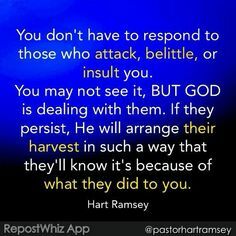 God showed me that He truly does protect His Children….and that He will let those that have offended us, know that they are getting some kind of reproof or correction based on what was done in violation to you, as His Faithful Servant. He showed me that there is no expiration date on a wrong committed, so the very moment that God reveals to us the wrong we committed to another member of our fellow man, it is our responsibility to make it right, at that moment, to which God reveals it to us. If we don’t He will correct us or punish us for not listening and obeying. He also showed me that He is so holy that He does keep account of every violation committed against His Divine Laws of Love. So it is our responsibility to continuously repent, to lead to the conversion of the mind, body, and soul; to become born again in soul and spirit. With parental care, for those that carry the testimony of His Unconditional Love, He puts you under His Providence. That someone who was once comfortable in living in the ways of this world, no longer is. I was transformed in this experience, to know of the Justice God can provide; and to know that we are required to recognize the sinful human nature, and to continuously repent for our violations against His Divine Laws of Love, even until our last breaths on this earth. I do not rejoice in any of this in what has happened in the earthly sense, but in this experience, it has become my testimony in how God is a JUST Father; yet to continuously refine ourselves, to rid ourselves of our sinful human nature, we are required to go through the trials, to break ourselves away from the world’s ways, so that the Holy Spirit can enter and refine our souls; since God says His Ways are not of the world’s, but are beyond them. Life on this earth may not be FAIR….but God requires us to be tested to see if our conversion is true. He is a Pure and Holy God, and our sinful human nature can not stand before His Pure and Holy Throne. We have to be continuous refined…continuously tested. This is my testimony of God’s great power and mercy. May all glory be His now and forever. This entry was posted in Testimony and tagged Armor of God, Battling Evil, compassion, Devum, discernment, Earth, enduring trials, evil ways are temporary, Eye for an Eye, Faith, Fight over souls (good vs. evil), God, God's Love, God's Promise, God's ways are permanent, God's Wrath, Good vs. Evil, Guidance of Holy Spirit, Jehovah, Jesus, Jesus and His Crucifixion, Jesus Christ, Justice for "the Just", Leading of the Holy Spirit, Listen for God's Call, Not "eye for an eye", Overcoming Trials through the Holy Spirit=God's Divine Tools for Ministry, Path to Truth, Persecution, Refiner's Fire, Satan's deception, Self Refinement, Spiritual Battles, Steadfast Faith, Testimony, Trials and Tribulations, Turn the Other Cheek, Yahweh, Yeshu, Yeshu Christu, Yeshua, Yeshuay on January 1, 2016 by foodforthespiritualsoul. Jesus Christ, as the Son of God, as the Member of the Most High Court of the Eternal Kingdom, came to this earth, and demonstrated to the utmost extent of how much God’s (Yahweh, Jehovah, Devum) Ways do not conform to the ways of this world. In fact, whatever we may hold in high earthly value, may not be held in the same esteemed value in the Eyes of God, and His Eternal Kingdom. As the King of all Kings, He was born in a cow’s feeding trough, in the cold, outside. His parents’ friends to join in the birth of their son were nomad Shepards and a Shepard Boy, with the animals of the stable they were in; joined by the 3 Kings of the East who were given the visions from God, of who this Baby was to be for Mankind and all of Humanity. We must understand that God’s Ways are beyond the world’s ways, and to understand the life of Jesus Christ requires more than going to Church, or reading about Him. It is about transforming to His Ways within the Divine Laws of Love, in mind, body, and soul. While being persecuted from His Birth to be killed, till His Adult Life, in His Crucifixion on the Cross, God showed His Ways are beyond the earthly ways…and earthly measures have no value in His Eternal Kingdom. MERRY CHRISTMAS; AND LET US CONTINUE TO REMEMBER THE ENTIRE STORY OF CHRISTMAS, IN ITS DETAILS AND STORYLINE, TO SEE GOD’S LOVE OF HUMANITY, THROUGH HIS SON, JESUS CHRIST…..WHO WAS BORN, LIVED, AND DIED FOR THE SAKE OF GOD’S UNCONDITIONAL LOVE. This entry was posted in Thoughts and tagged Almighty God, Armor of God, compassion, Devum, discernment, Earth, enduring trials, Evil, evil ways are temporary, Father God, Fight over souls (good vs. evil), Good vs. Evil, Jehovah, Jesus and His Crucifixion, Jesus Christ, Listen for God's Call, Path to Truth, Refiner's Fire, Satan's deception, Self Refinement, Spiritual Battles, Unconditional Love, Yahweh, Yeshu Christu, Yeshua, Yeshuay on December 25, 2015 by foodforthespiritualsoul. THE POWER OF THE PERSONAL TESTIMONY THAT GOD CUSTOMMADE FOR YOU…. Even he understood what God’s Divine Laws of Love meant, in ways of Nonviolence, Unconditional Love, and Mercy. It is more than words, it is a change of heart, which will be seen and felt by the actions witnessed by all of that born again soul. Even evil can not deny such a soul. A born again soul does not dictate to others that they can not change their mistakes from the past, or to love them as they are. This is what evil dictates, to accept in the darkness that is in human nature. God says, He knows the purity to which He originally created Mankind to be, as initially seen in the Garden of Eden, in Adam and Eve, before they took on the temptation of sin introduced by evil. God knows the original greatness that He created for Mankind to be, which is why it is our duty to serve others…to endure trials to rid ourselves from the darkness that we were born with, in human nature. We are to keep on refining and changing ourselves, with the goal of our Example, Jesus Christ (Yeshuay, Yeshu Christu). This is what Gandhi meant….we are to change, out of our love for seeking the Divine Truth, and not settling for Evil’s intention to remain in our sinful human nature, which is full of wrath, hatred and violence. But it is our duty to not cooperate with evil, at all costs, to the point of which Jesus Christ, as the Son of God, demonstrated with His Own Life…to the point of death. If God says His Ways are not of the world’s ways but are beyond them, that means we our so conscious of our souls belonging to God, and His Eternal Kingdom, that we realize that our sole purpose is to seek the ways of the Divine Laws of Love to the point of not caring how much is inflicted to the earthly body. The Unseen God, knows even the deepest and most inner thoughts of our hearts, minds and souls…and will judge accordingly. Human logic is so restricted that many can not see beyond what the human 5 senses can provide them. These are the things that evil can manipulate. But when you believe in an Unseen God, you will begin to see the things of this world for its true value within the Eternal Kingdom. And through each trial given on this earth, where God separates you from the logic of this world, He gives us the opportunity to see if we choose to seek the Divine Laws of Love of the Eternal Kingdom or not. This is the conviction He provides through a personal testimony through which one has used their freewill to choose to see God’s Wisdom in the trial, and become born again from it. Yes we are to forgive everyone. Even those who harm us. But God does say that any wrong should not be tolerated, especially with the knowledge He provides through the conviction of a personal testimony. It only knows truth, and nothing else. And will not tolerate any violations to the Divine Laws of Love (ways of Nonviolence, Unconditional Love, and Mercy)…either caused by others or within themselves. So beware, evil will try to convince and convict those who are followers of the Omnipresent God’s Divine Laws of Love, that they do not unconditionally love. Not true…..there is unconditional love…but not unconditional approval for what they represent in their thoughts, actions, and words. God is so pure, that any speck of impurity can not stand before His Presence in the Eternal Kingdom. And we are to keep changing and refining ourselves in accordance to God’s Divine Laws of Love. The minute God reveals to us the wrong we committed to someone, even if it was many years ago, it is our obligation in front of God, to make it right. We are held accountable for each piece of knowledge that God reveals to us…and any hinderance to carrying out that knowledge is only a hinderance of that soul, caused by evil. Remember Evil’s ways are restricted to the ways of this world..which means they are only temporary; the Unseen Omnipresent God’s Ways are Permanent and Eternal. This entry was posted in Thoughts and tagged A call to help fellow man, Armor of God, Battling Evil, Christ, compassion, discernment, Earth, enduring trials, Evil, Faith, Fight over souls (good vs. evil), God, God's Love, God's Promise, God's ways are permanent, God's Wrath, Good vs. Evil, Jehovah, Jesus, Jesus and His Crucifixion, Listen for God's Call, Not "eye for an eye", Path to Truth, Persecution, Refiner's Fire, Satan, Satan's deception, Self Refinement, Spiritual Battles, Spiritual Journey, Steadfast Faith, Trials and Tribulations, Turn the Other Cheek, Unconditional Love, Yahweh, Yeshu Christu, Yeshuay on December 12, 2015 by foodforthespiritualsoul. To believe in an Unseen God, often a topic of controversy. Many would say it is an escape to the earthly circumstances around us; others may say that it is this Force that guides our spiritual journeys to a Higher Purpose, to a Higher place. When we look at life, there is a lot of evidence to the existence of a Divine Force, but we have the choice everyday to decide whether we recognize its existence or not. As the slogan of my blog here states, “A spiritual path is not dictated by human logic, but by Divine Logic.” Let me take it one step further out and say that human=earthly logic. The Unseen, yet Omnipresent God, the Father of Creation, does not restrict His Existence or His Ways to the ways of His Creation. He is beyond them. Therefore, those that decide to follow a path in finding…seeking His Eternal Kingdom, will understand that the way to truth consists of ways that are beyond the world’s ways. So, the question is….why would Divine Rewards conform to the world’s ways? Why would Divine Punishment conform to the world’s ways? To an Unseen God (Devum, Jehovah, Yahweh) that says His Ways are beyond the world’s way….He is saying that the ways of this world are temporary. A soul rooted in seeking the truth, will know that there is more than things of this world, that is of value…of ETERNAL VALUE. That the things of this world, will come and go. Those that do become born again, in mind, body, and soul, see the true value of the things of this world, in accordance to the Eternal Kingdom. To believe in an unseen God means that you will be certain of your own flaws, but there is a perfect force, that provides a continuous supply of unconditional love. He gives us the choice everyday to seek truth; He never forces it upon us. But at the same time, He is the purest form of Love, and any impurity can not stand in His Presence. For faithfully seeking the Eternal Kingdom’s Truth, such souls will be led by the Holy Spirit, and will feel the truth of the Divine Laws of Love, professed by those who belong to the Eternal Kingdom. We have to remember that there are limitations to what we can do as human beings. By believing in the Unseen Father of Creation (Devum, Jehovah, Yahweh) He provides beyond the limitations of human beings, to those who faithfully seek, and allow for the wisdom God reveals in their trials to change their minds and souls. It is not a blind faith. This is what many misunderstand…it is a choice of chosing to seek truth at all costs. But if the Omnipresent God says His Ways are beyond the world’s ways, then what does that mean for the things that we hold of earthly value…does that mean it is not of the same value in the Eternal Kingdom? This entry was posted in Thoughts and tagged A call to help fellow man, Armor of God, Battling Evil, compassion, Devum, discernment, Earth, enduring trials, Evil, evil ways are temporary, Faith, Fight over souls (good vs. evil), God, God's Love, God's ways are permanent, God's Wrath, Satan's deception, Self Refinement, Spiritual Battles, Spiritual Journey, Steadfast Faith, Trials and Tribulations, Unconditional Love, Yahweh, Yeshu Christu, Yeshuay on December 8, 2015 by foodforthespiritualsoul. One of the biggest flaws in mankind, which is a part of the sinful human nature that we were born with, is that we are so quick to hide the wrongs we commit to others, and so slow to go and make things right, for how we have wronged another one of the members of mankind. Yes, it is true, we are to forgive those who have wronged us.But if they are not willing to change from the ways that they have wronged us with, we love and pray for their change from afar….so that they change from their evil inspired ways. They are required to change from those ways, if they call themselves Children of God. Evil will say that you do not need to change, you should be loved as you are, to accept the good and bad within…..they should “forgive and forget”. God knows the original greatness that He created Mankind to be before evil introduced sin, in the Garden of Eden. So we are required by Him, to change from the dark ways that make us sin. God has said, that His Ways do not conform to the world’s ways (His Creation’s Ways) but are beyond them. If we have come to understand God’s Divine Laws of Love, we would not be so slow to try to make the wrong things right, and we will be quick to repent to God, for the wrongs we have committed. But let us further explore this thought…. Is there an expiration date on the wrongs we commit to others, and have not addressed them to the wronged brother or sister…or even addressed it with God, the Father of Creation? I think Bob Marley, the famous reggae artist said it best when he said, “There is no hiding from the Father of Creation”. He keeps account of all the injustices, lies, and wrongs committed against His Children. It does not matter if it was committed 20 years ago…or 2 years ago, or even last night. God does not guarantee us tomorrow. But if we do wake up to another day, we should thank God for giving us another day…another chance….to make things right in His Eyes. But how many people realize this? And for those that have been wronged, and faithfully sought after God’s Divine Laws of Love….God will make sure that all injustice will bow down to Him….and He will protect the faithful. Isaiah 54:17 states: “No weapon formed against thee shall prosper. For this is the heritage of the servants of the Lord.” THERE IS NO EXPIRATION DATE TO A WRONG COMMITTED, THAT HAS NOT BEEN CORRECTED. This repentance comes from a heart that has been truly transformed by faith, in God, the Father of Creation (Jehovah, Devum, Yahweh). People who believe in Karma do it out of the Self Love of fearing a bad thing or occurrence coming to them, in the earthly sense. Whether it be losing finances, a job, multiple homes and cars, even an earthly death. Karma, is putting an earthly parameter on a spiritual thing. This automatically goes against what God has said, that “His Ways are beyond the world’s ways”. Karma is when one looks out for themselves, to make sure that they are provided for in the earthly sense…..more than living to what mankind was called to do, to follow the Divine Laws of Love. This “fear” is not the fear of making a Perfect God, who is Our Father, disappointed…this is an ungodly fear, coming from an evil force. God states that this repentance should be a continual process in one’s life, till the last breath in our earthly bodies. As it is stated in the Lord’s Prayer in the Holy Bible, God’s Name should be so”hallowed” within our lives and hearts, that His Divine Laws of Love are the driving forces in the lives of those who have truly become born again, in mind, body and soul….these are the people that will be promised entrance into the Eternal Kingdom of God. God asks us to go through the fires of earthly trials and tribulations…in order to rid ourselves of the selfishness and deception of human nature. He asks us to work towards purity…because His Kingdom can only have those with that intent….and these are the only people that will gain God’s Favor. This is what Jesus Christ showed us through His Life and Death on the Cross. Once we have decided to follow the same path to the Eternal Kingdom, just as Jesus Christ has showed us, we are to follow it at all earthly costs. God searches the minds, hearts, and souls…and harvests them accordingly….and He sees who has truly put His Divine Laws of Love first and foremost in their souls. This entry was posted in Karma Series and tagged Armor of God, Battling Evil, compassion, Devum, discernment, Divine Unconditional Love, Divinity of Jesus Christ, Earth, enduring trials, Evil, Good vs. Evil, Guidance of the Life Teachings of Jesus Christ, Jehovah, Jesus and His Crucifixion, Jesus Christ the Ultimate Symbol of Unconditonal Love, Refiner's Fire, Satan's deception, SELF LOVE vs. SELFLESS LOVE, Steadfast Faith, Take up your Cross, The Blood Covering of Jesus Christ, the Death of Jesus Christ, Trials and Tribulations, Yahweh, Yeshu Christu, Yeshua, Yeshuay on December 1, 2015 by foodforthespiritualsoul.